Campbell Scientific provides electric-field (field mill) and lightning-detection systems for warning or alarming at sports fields, mines, artillery sites, ammunition depots, electric substations and facilities, refineries, and other locations where lightning strikes pose a significant hazard. Measurements and data acquired by these systems provide officials and managers useful information to identify shutdowns or evacuations during prestrike conditions and resume-work-or-play conditions at the end of storms. See how one of our systems is helping keep events at Utah schools safe from lightning by reading the "Utah: Lightning Warning" case study. We offer a variety of products that can be used to create systems for Lightning Warning and Electric Field. Many of the major components used to create these systems are listed below. Please let us know if we can help you configure a system. Campbell Scientific has developed The CS110 Electric Field Meter to provide warnings of potential lightning strikes, allowing precautions to be taken that can save lives. 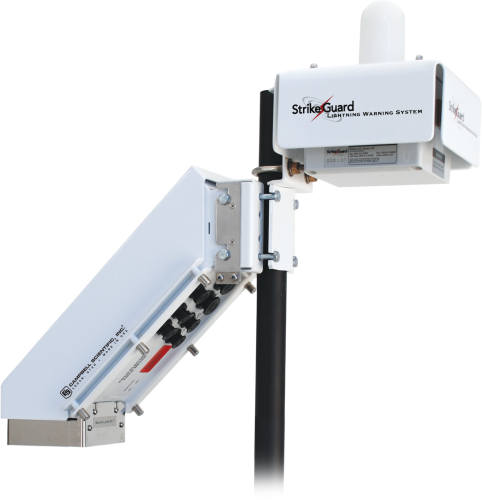 The CS110 measures the electric field induced at the ground by clouds located within a 5- to 7-mile radius of the sensor, from which the potential for lightning can be forecast. Lightning Warning System For OH&S.